The year was 1991. The cold war ended, the first web browser was introduced and kids were running around with Super Soaker water guns. Musical grunge band sensation Nirvana had the number one hit “Smells like Teen Spirit,” Arnold Schwarzenegger told his enemy “Hasta La Vista, Baby” in Terminator 2 and the Dowds launched Sundance Vacations. 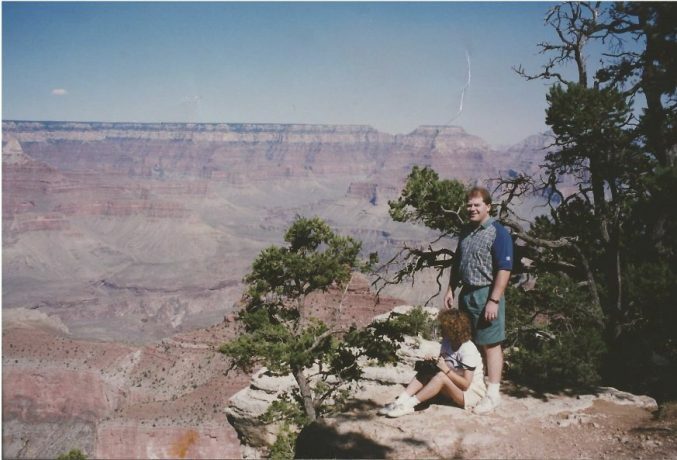 Co-owners of Sundance Vacations John and Tina Dowd at the Grand Canyon on one of their first vacations together. Over 25 years ago, John and Tina Dowd conceived the idea to start a trustworthy and reliable travel company. After working in the travel industry for a number of years, the husband and wife duo decided to take a risk and start their own business. In the beginning, “Sundance Vacations” was merely two people with a will and the dream of making vacationing easy and affordable for everyone. Making calls from their house, Tina began developing an employee base. She would spread out papers on her kitchen table and make calls for hours, confirming appointments with potential travelers. Eventually, they opened their first office in Pocono Lake, Pennsylvania in early 1991. Even then, the Dowds were thrifty, buying fold-up tables for their eight employees to use as desks. Tina even brought in her favorite bean-bag chair and made calls from the comfort of her cushioned seat. That’s when things really began expanding. Over the next few years, Sundance Vacations offices began springing up all over the United States. Currently, we operate nine offices, including locations in Harrisburg, Pa., Parsippany, N.J. and Washington DC. Sundance Vacations CEO John Dowd was ranked among the Highest Rated CEOs for Small Businesses on Glassdoor in 2015. As our locations expanded, Sundance Vacations awards began piling up as well. From winning Best Places to Work recognition in multiple states to being acknowledged by Inc. 5000 as being one of America’s Fastest Growing Private Companies for three years in a row, Sundance Vacations is always receiving notable mentions. 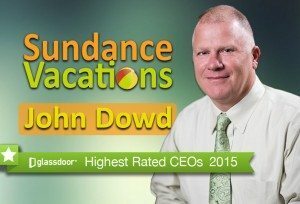 In fact, John Dowd was just named to Glassdoor’s 2015 list of the Highest Rated CEOs with an impressive 95% approval rating, placing him 8th overall in all of North America. John and Tina’s very first employee, Clara Fellows, is still with Sundance Vacations today. As a part of the team for over 20 years now, Fellows says she loves all that our company stands for and sees herself staying here for many more years to come. Of course it’s legit! We’ve been around almost a quarter of a century, sending people to places all across the United States, the Caribbean and Mexico. Sundance Vacations reviews keep pouring in as more and more travelers thank us for introducing them to such wonderful destinations. “It totally exceeded our expectations,” David and Marian O. said. The two are Sundance Vacations travelers from Philadelphia, Pa. and recently traveled to Florida using Sundance Vacations. With the thousands of travelers we have now, Tina reflects on how funny it is to look back and remember the beginning. As we plan for the future, we are excited for the opportunity to introduce even more Sundance Vacations destinations to our travelers and to continue providing quality vacations for less. Jennifer is the Digital Marketing Coordinator for Sundance Vacations. She creates the fun videos you see on our YouTube channel, writes for our Blog, News, and Charities websites, and posts for our social media outlets here at Sundance. It is amazing to see the accomplishments of Sundance Vacations throughout the years. Best wishes for even better things to come in the future.